With a stay at NOFO Loft, you'll be centrally located in Stockholm, a 5-minute drive from The Swedish Museum of Photography and 13 minutes from Stockholm City Hall. Featured amenities include complimentary newspapers in the lobby, dry cleaning/laundry services, and a 24-hour front desk. Self parking (subject to charges) is available onsite. When you stay at Olseröds Bed and Breakfast in Degeberga, you'll be by the sea and 12 minutes by car from Angshyddan Gallery. Free self parking is available onsite. Located in Astorp, Hotel Milano is within a 15-minute drive of Church of St Peter and Aby Museum. The front desk is staffed during limited hours. Free self parking is available onsite. 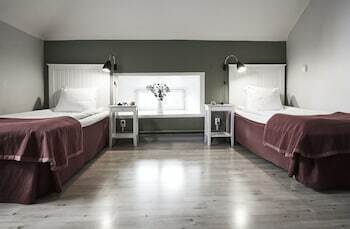 Located in Lund, Lilla Huset på slätten B&B is in a national park, within a 10-minute drive of Sony Ericsson Headquarters and Kungsmarkens Nature Reserve. Free self parking is available onsite.